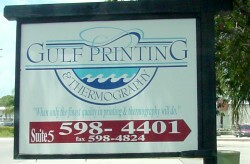 Gulf Printing & Thermography No matter what your idea is, we can assist you in putting those ideas to print. Since 1993, Gulf Printing & Thermography, Inc. has been satisfying customers from all across the South Florida region, and we welcome the opportunity to serve your printing needs. Our services include business cards, carbonless forms, announcements, 1-4 color brochures, stationery, newsletters, booklets, menus, and much more. For your next printing project, call or fax us for a quote. 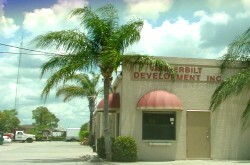 Airport Rd. to J&C Blvd. Turn west and proceed 1 mile to Taylor Rd. and turn left (south) on to Taylor Road. Proceed .3 of a mile and you will see our sign on the left. Turn into the parking lot and we are half way down the side of the building. Pine Ridge Rd. to Taylor Road.Turn North and Proceed .5 of a mile. Look for our sign on the right side and pull in there. We are halfway down on the left side of the building.